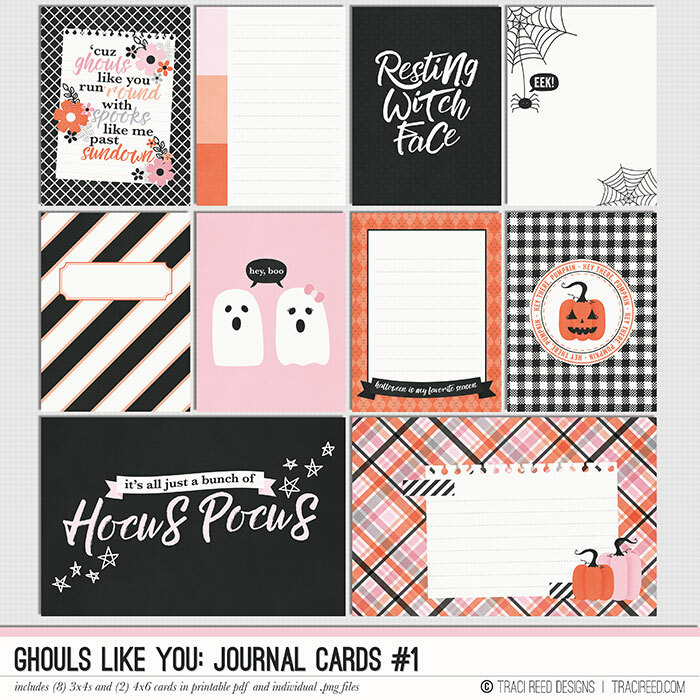 Oct 19 Shop Update: Ghouls Like You Printable Bundle + a FREE gift! Hello, hello, hello! And Welcome to my brand new printable shop! I’m so excited to be jumping out on my own and serving customers directly with fantastic, high quality products that I think you’re going to love! It’s long been a dream of mine to have my own, no pressure shop producing exactly what I want to make for customers like you! My very first new product in the TRD shop is Ghouls Like You. The idea for this collection was born out of the desire to proved a pretty and not too spooky Halloween collection that celebrates your “Ghoul Squad” for halloween. It combines traditional halloween colors with pops of ultra-feminine pink, fun and sassy phrases perfect for the boo crew, Ghouls Like You is a modern, sophisticated and timeless take on Halloween! As I was designing the product, I had “Girls Like You” by Maroon 5 stuck on repeat in my head (let’s face it - for WEEKS prior to making this product) and something just clicked and the title “Ghouls Like You” was born! I even re-worked the lyrics for a journal card! This collection truly is a work of heart and I adore it so much because it represents a new beginning to me! Check out the full product line up and click through on any image below to go directly to it in the shop! When you want a minimalist feel, but you also LOVE color, my card packs are the perfect touch for your pocket scrapbooking, traveler’s notebooks and even regular layouts! Adorable AND useful, all of my card packs are designed to be a good mix of designer and journaling cards to fill the needs of all scrapbookers. I’m excited to be offering a new product line to help ease the hybrid scrapbooker’s use, 4x6 cards that have all the patterns in the collection! You can use as a 4x6 or cut in half for a 3x4, without having to print a full TN sized paper! In the Traveler’s Notebook sized papers, you get each pattern in 4.25x8.5” to accommodate most standard-sized inserts. These are also perfect for the hybrid scrapper who doesn’t have access to a 12x12 printer, but wants to use the papers in their 12x12 or 8.5x11 - perfect for layering and paper strips on any cardstock size! However, if you’re able to print 12x12 or what full 8.5x11 sheets, 12x12 papers are available as well! Each collection comes with both patterned and textured solid papers! Digital stamps are some of my FAVORITE toys! You can, of course, use them in your photo editing program, but you don’t need a photo editing program to use them! Check out my IGTV video on using these stamps (and the digital stickers!) in the Letterglow App! Last but not least, my love for digital stickers is REAL and in the Ghouls Like You collection, you get not one, but TWO sheets of stickers to play with! The first sheet is full of journaling bits and word art, while the second has all the sticker icons from the collection - plus a couple banners! The stickers come on both individual .png files and printable sheets and all my printable sheets are designed to be EASY to fussy cut with straight lines on the word bits and circles designed for the standard circle punch sizes! On the icon sheets, the stickers come with faint fussy cutting guides, or just run them through your silhouette! Phew! That’s a lot of adorable product! Let’s check out some of the hybrid AND digital examples my teams have come up with! Finally, I know some people are hesitant to try out this whole digital/printable product thing, so I’ve provided a 100% FREE product for you to try out and see how you like it! 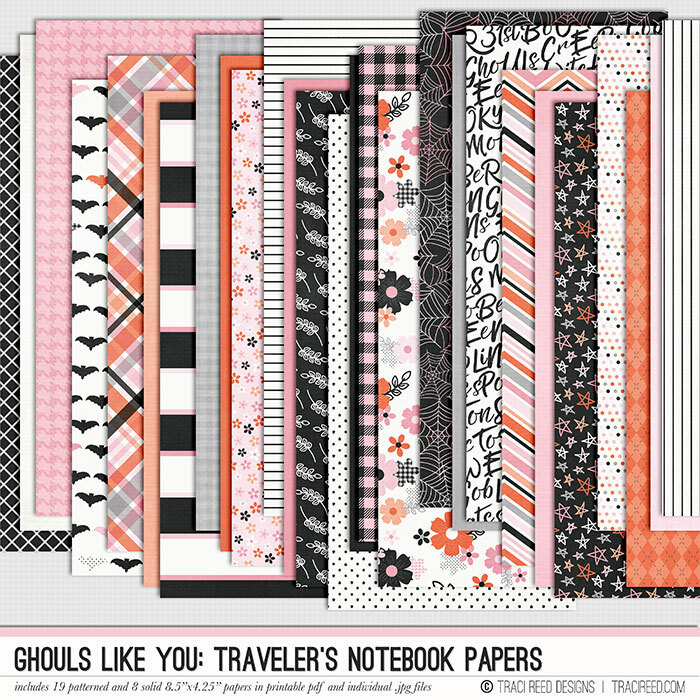 The Ghouls Like You sampler includes two Traveler’s Notebook sized papers, two 3x4 cards, two sticker labels and two digital stamps, for FREE! The Ghouls Like You Sampler is available for a limited time only, so make sure you click through and grab it today!